KNOXVILLE, Tenn.— A William Edmondson sculpture, a coveted collection of Civil War material, and a large selection of jewelry – fresh from Southern estates – are expected to heat up the Winter Case Antiques Auction, set for Saturday, January 26th at the company’s headquarters in Knoxville. The 860-lot cataloged auction also features an exhibited collection of Southern pottery, paintings by listed American and European artists, and Chinese antiques, along with select pieces of art and porcelain deaccessioned by two Southern museums. Sculpture figures prominently in the auction’s fine art category. Most notable is Miss Lucy, a carved limestone depiction of a woman by William Edmondson, an outsider artist who in 1937 became the first African American to have a solo exhibit at the Museum of Modern Art. The figure comes from the estate of a Nashville woman whose co-worker at Peabody College, Sidney Hirsch, is credited with helping introduce Edmondson to the New York art scene. Sharing the sculpture spotlight in this sale are three bronze figures of ballet dancers including Rudolph Nureyev, all by Richard MacDonald (a former artist in residence with London’s Royal Ballet), and a surrealist bust by Sergio Bustamante. The auction also features works from the estate of award-winning Tennessee sculptor, Olen Bryant. About a half dozen figures in wood and ceramic will be offered, along with part of the art collection amassed by Bryant and his partner, late Vanderbilt University art professor Thomas Brumbaugh, including a Jacob Epstein bronze sculpture of dancer Pola Nerenska, a small John Piper abstract, and several Spanish Colonial paintings. From the estate of Delle Brown, a longtime Nashville art and antiques dealer, comes an exhibited Gilbert Gaul oil landscape titled Tennessee Farmyard, a Thomas Hill still life, and a China Trade oil. The auction also features an exhibited view of Cape Ann by Charles Woodbury, a Hayley Lever dock scene, a large Louisiana bayou painting by Knute Heldner, 3 landscapes in oil and watercolor by Wolf Kahn, a collection of Texas landscapes including a bluebonnet scene by William Thrasher, and an Alaskan mountain landscape by Magnus Heurlin. Other artists represented include David Driskell, George Elmer Browne, Charles Edwin Lewis Green, Walter Farndon, Anna Brewster, and Benjamin Stahl. Three large and vibrantly colored abstract works by Stephen Sacklarian, deaccessioned by the Mississippi Museum of Art, are also available. Visitors to the gallery can’t miss the life-sized painting stationed at Case’s entry depicting General Andrew Jackson on the battlefield, attributed to Emmanuel Leutze (after the 1820 portrait by John Vanderlyn). Other portraits in the auction include an 18th century oil of Tamar Boardman Taylor attributed to Ralph Earl; two cabinet sized portraits of young men from the Barnewalle family attributed to Francis Wheatley; a portrait of a British officer by Norman Macbeth; 19th century Southern folk art portraits; and a handful of 17th century portraits attributed to the circles of Daniel Mytens, Jonathan Richardson and Sir Peter Lely. Works on paper include a graphite mural study by Diego Rivera; 20th century signed limited edition lithographs by Marc Chagall (The Red Bouquet, David & Absalom) and Jean Miro (Homentage a Joan Prats); two Gustav Baumann woodcuts (Salt Creek, Pine and Aspen); and etchings by Alfred Hutty (Southern Villa No. 1) and Frank Benson (Winter Wild Fowling). There are also six August Sander photographs from his visual study of the people of Germany, People of the Twentieth Century, printed by his son, Gunther Sander, and seven photographs by Bert Stern of Marilyn Monroe from the so-called “Last Sitting,” — a Vogue photo shoot at the Bel-Air Hotel, six weeks before the actress was found dead of a drug overdose. Civil War buffs are already buzzing about a large cache of Confederate weapons and accessories, including a rare Battle of Shiloh personal or “Bible” flag that originally belonged to S. Duff Lewis of Tennessee. Military historian Greg Biggs, who assisted with the seven-page catalog entry for the flag, writes it is the first Polks Corp Pattern flag he has seen in 28 years of research. There are also several valuable weapons from the estate of Jim Maconkey of Landrum, South Carolina, including an early Confederate Griswold .36 caliber revolver (serial number 133); a Morse breech loading .52 caliber Carbine rifle; a Confederate blockade run 1862 Enfield Tower Rifled Musket; a cased Hyde & Goodrich marked Tranter Revolver; a D. Kernaghan (New Orleans) marked Tranter with Vicksburg marked holster; a cased pair of Schneider & Co. Memphis derringers, and a scarce C. Suter, Selma, AL, marked derringer. Also from the Maconkey estate are belt buckles and plates, holsters, and more than a dozen cartridge and cap boxes (some identified to particular soldiers), and multiple Charleston slave tags. The category is further fortified by the weapons and ephemera collection of Benjamin Dysart III of Brentwood, TN, comprised of several Colt, Nimschke and Tranter revolvers, and ephemera including a CDV album containing images of multiple Confederate generals. Six autographed letters, signed by John Mosby (the Confederate “Gray Ghost”) are also offered, along with oil portraits of Confederate generals and bladed weapons such as a Griswold saber bayonet and a Nashville Plow Works sword. Bidders interested in gold, diamonds, and other gemstones have more than 100 lots of fine jewelry from Tennessee estates from which to choose. Among the highlights are a 27-carat diamond line bracelet (comprised of 27 diamonds, each approximately 1 carat); a 44-carat H. Stern Brazilian aquamarine and diamond ring; a 29-carat heart shaped aquamarine and diamond pendant, gold jewelry by Cartier, Tiffany and Signoretti, and a 73-carat emerald and diamond “Chinaman” brooch, circa 1960, by mid-20th century designer Giulio Nardi of Venice. There are also nearly 100 lots of sterling and coin silver in the auction, including a Japanese .950 silver tea service and a heavy Mexican silver tea service; Baltimore repousse hollowware and flatware (Schultz, Kirk, Steiff); a Hamilton & Co. Edwardian sterling epergne; a Rebecca Emes and Edward Barnard cake basket; a scarce Edwardian sterling egg cruet; sets of sterling julep cups; a Bier sterling menorah; flatware sets by Gorham, Whiting, and Reed & Barton; coin silver hollowware by John and James Cox and Nehemiah Bassett and Joseph Warford; and Sheffield plated entrée dishes, a meat dome, and candlesticks by Matthew Boulton. Southern pottery is a staple at Case, and company president John Case says this auction features the most significant group of it the company has ever offered. Leading the lineup is a copper oxide and lead glazed earthenware double-handled jar made by Christopher Alexander Haun (1821-1861), a Union-sympathizing potter who was ultimately hung by the Confederate army for his role in burning a Railroad bridge. The clearly signed jar, with elaborate tread stamp designs at each handle, is in remarkably good condition. Also featured is the only known extant Haun jug, and several pieces of East Tennessee and Southwest Virginia pottery, all from the collection of the late Brad Swanson of Abingdon, Virginia. A number of Swanson’s pots are illustrated in reference books on Southeastern pottery. Several were exhibited in the 2005 “Legacy in Clay” exhibit at the William King Regional Arts Center in Virginia, including several pieces of cobalt decorated stoneware, and interesting earthenware forms from the Cain, Mort, Vestal and Magee potteries of Virginia and Tennessee. The ceramics category also includes a collection of Vienna hand decorated porcelain portrait plates deaccessioned by the Hunter Museum of Art to benefit the acquisitions fund; Meissen figures; Sevres; and a large selection of Herend, including Rothschild Bird dinnerware with blue borders. 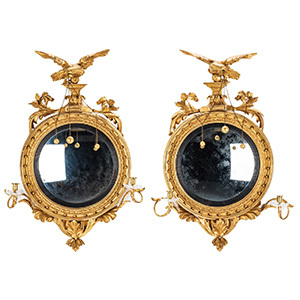 A rare pair of American Federal girandole mirrors with eagle crests stands out among the furniture offerings, along with a pair of signed French Empire fauteuils, a Federal desk attributed to Michael Allison of New York, a Federal desk signed by Joseph Lyndall of Philadelphia and dated 1812, and a near pair of inlaid Federal chests attributed to Norfolk, VA or Britain. Other regional furniture includes a rare Southwest Virginia pie safe sideboard with urn tins; 2 Tennessee sugar chests, a Pennsylvania Gothic Revival secretary, an exuberantly inlaid tiger maple chest (possibly Ohio); and a tiger maple server and miniature chest from the Cheney Plantation, Marietta, GA. 20th century furniture includes a signed Philip and Kelvin Laverne “Eternal Forest” coffee table; an Eames lounge chair and ottoman by Herman Miller, a Knoll stool, and an Edward Wormley for Dunbar bar cart and coffee table. There are a number of Asian antiques available, among them a scroll signed Wang Hui after Shen Mo; a pair of Guangxu Imperial lemon yellow saucer dishes; several lots of jade – including a Ruyi scepter and arm rest; bronze censers and gilt bronze figures; snuff bottle collections, and four framed Daoist scrolls depicting characters in Diyu (courts of the afterlife). Other standouts in the sale include a clock by Mallet, France, with bust of George Washington; a Tiffany Studios bronze “Lily Pad” mirror; a vibrant Gees Bend quilt; a prize winning Cherokee basket by Eva Wolfe; a signed Loetz Phanomen art glass vase; rare maps; coins and currency; and a hand painted Haviland fish plate from the Rutherford B. Hayes White House dinner service. The complete catalog for the auction, with full descriptions, price estimates, and photographs for items, in the order in which they will be sold, can be viewed online at www.caseantiques.com. Case’s gallery is located at 4310 Papermill Drive in Knoxville. The auction begins Saturday, January 26th at 9:00 AM EST. Online, absentee and phone bids will also be accepted. Persons wishing to preview the auction may do so on Friday, January 25 from noon to 6PM EST or by appointment. For more information or to consign objects for a future auction, call the gallery in Knoxville at (865) 558-3033 or the company’s Nashville office at (615) 812-6096 or email info@caseantiques.com. 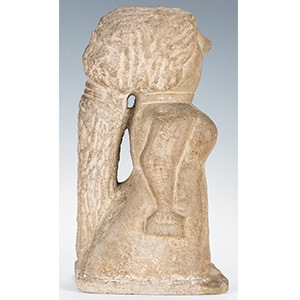 Lot 110: Miss Lucy, a 15 ½” carved limestone sculpture of a woman carrying purse and book, by William Edmondson (American/Tennessee, 1874-1951), is estimated at $70,000-75,000. Lot 265: Small personal or “Bible” flags were often made by women for their menfolk to carry during the Civil War. 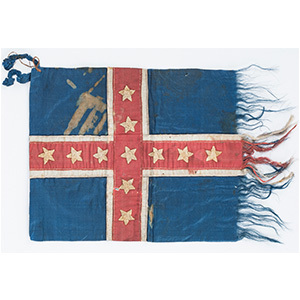 This Shiloh-related flag is the only known example of the rare Polk’s Corps pattern. It belonged to Private Duff Lewis of Tennessee. Est. $3,400-3,800. 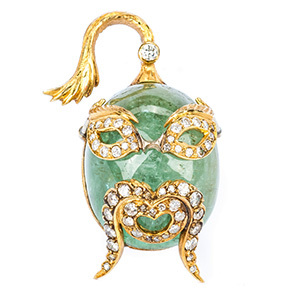 There are more than 100 lots of jewelry, including this “China Man” pendant/brooch lot 33 with 73-carat cabochon emerald and 55 diamonds, made by Venetian jeweler Guilio Nardi circa 1960. Est. $4,000-$5,000. There are three paintings by Wolf Kahn (German-American, b. 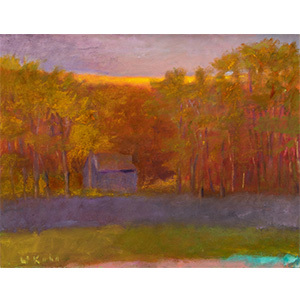 1927), including lot 523 oil on canvas landscape titled, “Glow on the Ridge,” est. $10,000-$12,000.